So, here I am earlier this Thanksgiving Day morning eating my “traditional” oat bran breakfast and thinking about this holiday from the perspective of cardinal and gold thankfulness. There are a lot of things to be thankful for during these past 56 years of being a part of USC football, which for me has spanned a lifetime. Some might even call it an obsession. So, allow me to share and compare my thankfulness with your own. * I am thankful that my late Uncle Eddie introduced me to USC football back in 1962, and as a 12-year-old, I witnessed legendary coach John McKay’s first national championship team. I’ll never forget the first time seeing the beauty of those cardinal and gold home uniforms, the greenness of the Coliseum turf, and watching my first experiences of a UCLA and Notre Dame rivalry game. The ND quarterback was the legendary QB Daryle Lamonica. And, yes, my first Rose Bowl game was against the No. 2 Wisconsin Badgers in that all-time classic shootout. * I am thankful that in 1963, I “survived” the deadly and oppressive Coliseum heat of the No. 1 Trojans narrow 17-12 loss to No.3 Oklahoma and their legendary coach Bud Wilkinson. It still remains, for me, the hottest Saturday afternoon in the Coliseum that I have ever experienced, which is why only 39,345 showed up in the Grand Old Lady. * I am thankful that I was able to grow up listening to the great Tom Kelly call Trojans games on KNX radio, and I will never forget listening to “Mr. 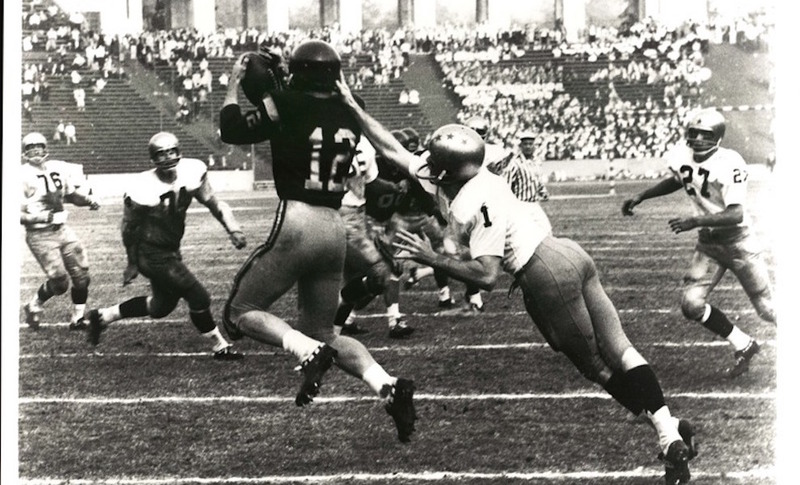 Mercy Nurse” call the famous Craig Fertig to Rod Sherman touchdown pass that upset the undefeated Irish, 20-17, in 1964 (see photo above). * I am thankful that in 1967, I would drive my 1962 Chevy Impalla from my Monterey Park home to USC’s “closed” practices. 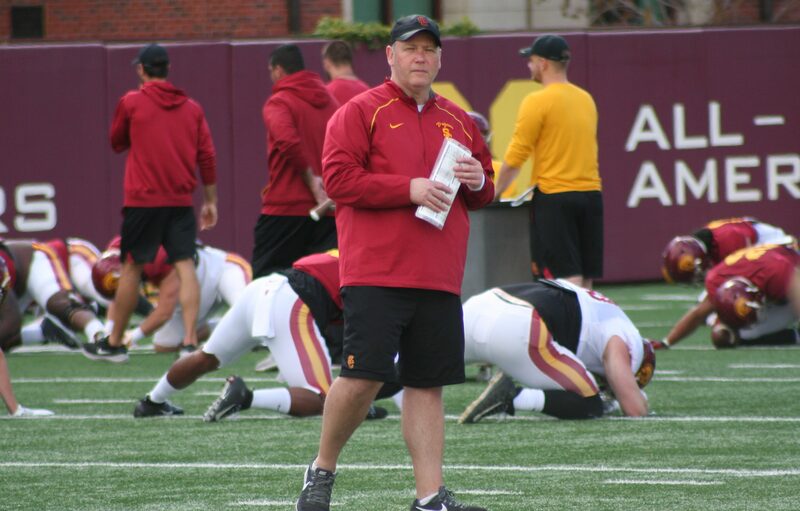 Coach McKay must have thought I was nuts coming down for “closed” practices, and one day while walking through the wooden entrance gate into Bovard Field, McKay turned to me and said, “What are you looking doing? Just get in there.” I was in awe. McKay was telling me walk in with him, go sit on the baseball bleachers, and watch practice. What a memory!!! Who can forget see a young O.J. and those two massive OL tackles, Ron Yary and Mike Taylor. * I am thankful that in 1967 I was in the Coliseum for the greatest USC/UCLA game ever played and witnessed O.J. Simpson’s immortal 64-yard touchdown in the fourth quarterback to defeat the Bruins 21-20. Simpson’s 13-yard run in the first half may have actually been greater than his legendary run. And McKay captured his second national title. * I am thankful in 1968 for having a block USC season tickets with some of my high school cronies who remain friends as of today and still extremely loyal Trojans football fans. Yes, this was the season when the No. 2 Trojans tied the No. 9 Irish, 21-21. You remember tie games, don’t you? During this time, Notre Dame remained an all-male university. I remember sitting high up behind the end zone in the closed end of the Coliseum all bemoaning that Simpson couldn’t penetrate the physical Irish defensive line. I remember looking at the game program and the Irish players looked like they were inmates on leave from San Quentin. * I am thankful that throughout all these years, Trojans football has kept a bond with lifelong friends such as “Abby”, “Tiny Tim”, Bob AKA Robert Jeffrey, Ricky L., and rekindled high school chums like “Coach Dorman”, Dave D., Jeannie A, Timmy C, and, of course, occasionally seeing the legendary “Babus” sitting in his customary season tickets seat in lower Tunnel 5. * I am thankful that in 1972 I was a recreation leader for the City of Monterey Park and had my 8th grade Repetto flag football team wearing USC uniforms T-shirts. I would take my young quarterback to USC media day, which was open to the public and held on campus, and made him take a picture of himself wearing a USC helmet. The young 11-year-old quarterback? Perhaps you recognize the name Gary Klein, once the Trojans’ beat writer for the LA Times and current Times beat writer for the Los Angeles Rams. I am also thankful that many decades later, I was covering the Trojans at Oregon for WeAreSC in Autzen Stadium and sitting next to me in the press box was the same Gary Klein. We both laughed how far we had come and now were sitting together in Eugene, Oregon. * I am thankful that in 1972 I witnessed the greatest USC football team ever and watched this incredible group of players destroy Ohio State, 42-17, in the Rose Bowl. I got to see up close legendary Ohio State coach Woodie Hayes and, of course, Sam Cunningham make those breathtaking four dives into the Buckeyes’ end zone. That three consecutive Rose Bowls (73, 74, 75) were incredible. It wasn’t New Year’s Day without the Trojans and Ohio State in the Granddaddy of Them All. * I am thankful that in 1974, I can lay claim I was in the Coliseum when the greatest USC comeback ever took place against Notre Dame. You know the final score: 55-24. It was by far the loudest I have ever heard the Coliseum. If you were there, you know what I am talking about. I can you ever not be thankful for the greatness of Trojans’ tailback Anthony Davis. Ask Irish fans who is the most hated Trojans of all time. Kind of a rhetorical question. * I am thankful that in 1974 I witnessed the Trojans beating Ohio State 18-17, when quarterback Pat Haden jump-passed a two-point conversion to WR Shelton Diggs for the winning margin late in the fourth quarter. I also got to see a future friend named Kevin Bruce, now a beloved WeAreSC defensive columnist, play with reckless abandon from his inside linebacker position. Let me tell you, Kevin still can convey his passion for USC football even today, but I am preaching to the choir on that one. * I am thankful that when I once co-operated one of the first high school all-star basketball summer camps for competition – the USA Olympic Development League – our San Diego area team included a senior named Marcus Allen and our Inland Empire team had a senior named Ronnie Lott. Now you talk about two tremendous basketball players, you should have seen them go up and down the court, especially Ronnie, whose athletic ability and physical maturity and intensity was intimidating even as an off-guard. * I am thankful that I got to witness the John Robinson 1 era and those fabulous offensive lines led by the likes of Brad Budde, Pat Howell, Keith Van Horne, Anthony Munoz, etc. Who knew that later in life, my uncle Eddie’s physical therapist in San Clemente would be the great Brad Budde. I won’t forget either after the huge 1980 Rose Bowl 17-16 victory over Ohio State and being invited to Trojans’ linebacker coach Artie Gigantino’s Long Beach house for a “post-coaches” party. It’s where I met an up and coming agent out of Cal Berkeley named Lee Steinberg. * I am thankful to USC football and WeAreSC to still be in awe walking up the Coliseum players’ tunnel after home games. It never gets old. If you’ve never had that experience, it’s worth the price of admission. * I am thankful to have met the families of Trojan greats like Clay Mathews, Allan Graf, Pat Howell, Ryan and Matt Kalil, and Matt Barkley. We sometimes forget that the families are under a lot of stress because of the amount of scrutiny and stature of USC football. Just class people through and through. * I am thankful for being able to meet and talk football with such Trojans legends as quarterback great Jim Hardy. * I am thankful to have seen every Trojans’ Heisman Trophy winner play at the Coliseum along with every All-American since 1962. * I am thankful that I have been able to cover USC games at such gridiron cathedrals as Notre Dame Stadium, Nebraska’s Memorial Stadium, Ohio State’s “Horseshoe”, the Rose Bowl, Cotton Bowl, Orange Bowl, the Pac-12, and the list goes on and on. 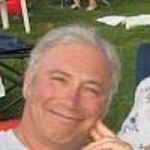 * I am thankful that my longtime girlfriend, Sharon – once my high school girlfriend – reunited with me later in life and although she’s a lifelong UCLA fan (her son went to Westwood), she still roots for the Trojans unless they’re playing the Bruins. * I am thankful my late mother was a huge USC fan. * I am thankful my late Dad, a huge UCLA fan, was totally in respectful of the USC football program. * I am thankful for my friendships with my fellow USC reporters even though some are our competitors like Dan Weber, Ryan Abraham, Scott Schrader (son of legendary journalist Loel Schrader), Adam Maya, Alicia de Artola, and Times columnist Bill Plaschke. And, of course, the great radio voice of Coach Harvey Hyde. * I am especially thankful for my adult friendship with Hall of Fame sports writer Steve Bisheff and our wonderful lunches and dinners at the Katella Deli after games in which I am treated to his plethora of sports memories ranging from his relationship with John McKay as a reporter for the Daily Trojans and later the Los Angeles Herald-Examiner to riding in a limo with Muhammed Ali and getting a scoop. Ironically, Steve and I both went to the same high school (Alhambra) and were former sports editors for “The Moor” and were tutored by the same legendary journalism teacher, Ted “Mr. T” Tajima. 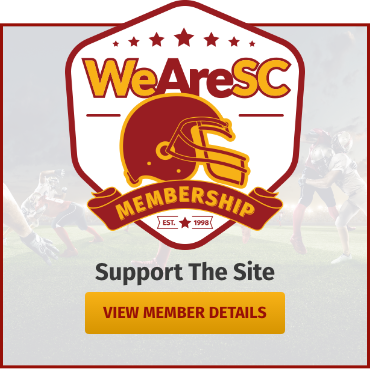 * I am thankful WeAreSC publisher Garry Paskwietz for giving me the opportunity to write for a new up and coming website at the time that would revolutionize how USC football would be covered on the Internet. That affiliation allowed me to write for ESPN for a number of years, which was quite an experience until there were massive cutbacks that affected everybody in some shape or form. * I am thankful for living through the Pete Carroll era when naysayers said that USC football was dead and would never return to the John McKay era dominance. Wrong! Perhaps of all the tremendous accomplishments that Carroll achieved during his time at Troy, it was his unique ability to bring a massive USC fan base together to attend Coliseum home games where sellouts became the norm. Who believed Carroll when he said early in his tenure that one day the Coliseum would be filled on a regular basis. What an era to be mostly thankful for, but I didn’t like the way it ended. * I am thankful that I was in Notre Dame Stadium in 2005 when quarterback Matt Leinart brought the Trojans back from the dead to crush Notre Dame Stadium with the last second “Bush Push.” I have NEVER seen Irish fans in South Bend so angry after that loss. And I am thankful to have been at Ohio State when a young true freshman quarterback named Matt Barkley drove the length of the field in the final minutes to win in as hostile and loud road environment you’ll ever witness. * I am thankful to have been going to USC football games in the Coliseum before this sickening Coliseum renovation destroyed much of the country’s greatest football and sports venue. All done in the name of money and the elite. Sad. * I am thankful I’ve been able to see such players known by their nicknames and position unit nicknames that are symbolic of Trojan football, and how many can you recognize: The Juice, The Wild Bunch (original), Sam “Bam”, Batman, A.D., the B boys, Comet, Iron Mike, Bambi, LoJack, Thunder and Lightning, The Tree, Bug, Prince Hal, Trapper, Big Ben, and Sweet Peete. * I am thankful that I was the public address announcer for the 1996 Rose Bowl game featuring the Trojans and Cinderella Northwestern. What a tremendous thrill and honor. I have a Rose Bowl “brick” near Entrance A as evidence of this thankful memory. Yeah, I am next to Harvey Hyde and John Robinson. Talk about me being out of place. * I am thankful we all survived the horrendous sanctions that eventually brought us the forgettable Lane Kiffin and Steve Sarkisian eras. * I am thankful that despite all the turmoil of this 2018 season and the uncharted future, I am still alive to experience the good and the bad. On to 2019 and hopefully many more memories to be thankful. 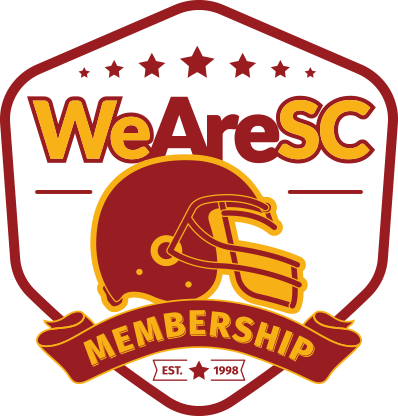 * Lastly, I am thankful for all you WeAreSC readers, whether you have agreed with me in the past or have corrected my miscues or have taken issue with some of my viewpoints. All are appreciated, and I wish you all a very pleasant Thanksgiving and weekend and, most importantly, Beat the Irish!